Man, does every language have a proverb meaning practice makes perfect? Practice is one of the key principles of learning, and probably one of the most demanding ones. One of the most helpful way to practice your skills in language learning is to speak the language you're studying. No matter if you've just begun or were fluent 3 weeks ago, if you don't keep using that language it's likely to get pretty rusty. In today's blog article, I'm going to give you the full review of an app that has been designed to help you with that need for practice. It's all about language exchanges. Read on to find out if this could work for you. How Should a Language Exchange Work? Language exchanges work on the basis that both people in the conversation give a little bit of their skills to each other. You find a person who studies your native language and help them by correcting them and chatting to them. And then you switch the exchange and benefit from the same help in your target language. And if you chat to them online, you don't even have to leave your house/bed/swimming pool. Of course, the real challenge is getting to the point where your conversation with the practice partner is as easy as possible. It can be really difficult to find a native speaker of the right language who also wants to spend time practicing with you. And then you have to hope they want to learn your language, too. And then you still have to get over how to translate most of what they say. In the past, my language exchange experiences have never really delivered. Even though I found people online and wrote to them, I felt like my own language skills didn't improve. It was scary to hop on Skype and share my face, voice and mistakes with a stranger. When I tried email exchanges, I felt bad because I couldn't write a long stretch of text. It seems I wasn't the only person who had this problem. When HelloTalk contacted me earlier this year with an invitation to review their app, I was ready to try again. My first impression of trying HelloTalk was very positive. The app is about making language exchanges on your smartphone as good as they can be. There is no course, no website and no payment system for tutors, and I really appreciated that focus. After downloading the app, you'll be asked to fill in a profile. HelloTalk allows learners to register one native and one target language for free (though you can unlock more with an in-app purchase). You can connect your profile to Twitter, record a spoken intro, or write an introduction for yourself. For users who want to keep their details private, the app also allows you to hide details like your age or location in the advanced privacy settings, and to set how you want to appear in the search. Test 1: How Easy Is It To Find Language Exchange Partners? After signing up, HelloTalk directs you to its Search function so you can start finding people whose needs match yours. It automatically suggests matches that have the right native language/target language combination for you, but you will not be restricted by this at all. When you find someone who looks like a great match, you can send them a message or a partner request. I found that most of the promising matches were not online straight away, so sending them a request that they could accept when they come online was a convenient alternative. It seems that people who indicate "English" as their native language receive a lot more requests (for example, Shannon from Eurolinguiste found that she couldn't keep up) than other natives. Setting the app to "native German speaker who is learning Welsh" was a pretty tough ask, so I tried some search alternatives to find native Welsh speakers. With those options, it became simple enough and I was quickly able to get talking to several people. Once the chat got started,I was impressed with the many tiny but useful features. For example, HelloTalk shows you the time of day where your language partner lives and supports emoji. You can send photos, voice messages and doodles. All these options make it very easy to start texting other people straight away. Test 2: How Good Is HelloTalk's Interface? HelloTalk's app has lots of buttons and settings, but none of them felt pointless. I quickly found that the help menus and settings were simpler than they looked. HelloTalk can do lots of things, but it has pulled off a design that doesn't overwhelm users with all of them at once. Instead, the app takes advantage of how you use your phone, and the bottom menu makes it simple to keep track of conversations. The quality of the app was fabulous as well. Even though I haven't had the chance to try the free phone calls, I was impressed overall. It was fast, didn't crash and the machine translations were pretty useable too. Overall, a big thumbs up for HelloTalk's design. Test 3: Does HelloTalk Make It Easy To Use Your Target Language? In previous language exchanges, I often found that it was difficult to keep up a balanced exchange between speaking my own language and my partner's language. 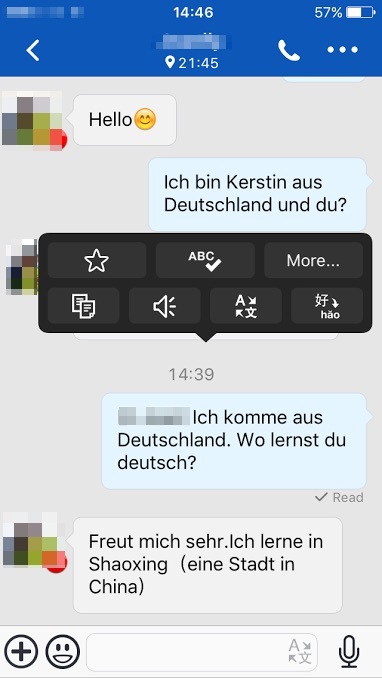 HelloTalk has an approach to solve this problem: There is a dedicated Language Exchange Mode where you can set the computer to remind both exchange partners when it's time to switch languages. I was super excited about this feature. The app also allows users to communicate in the way that works best for them. Free phone calls, instant messages, voice messages - no problem! Once you've started chatting, you may find that you and your language partner need a few corrections. The app has a great long press feature for any message sent or received, allowing you to correct the partner's writing easily. For someone as enthusiastic about writing in another language as I am, the app's features make a great addition to the tips I've blogged about before. Test 4: Does HelloTalk Work? If you want to keep studying based on what you're reading and writing in HelloTalk, there are a few really helpful features in the app. The corrections feature automatically saves your received corrections to the favourites section where you can go back and review them regularly. In this area, I thought it would be cool to have a flashcards or other learning feature but on the other hand I was pretty happy to just use my notebook. HelloTalk is not about acquiring another language by studying a linear course, but instead it brings real life practice to your phone and it does this one thing brilliantly. I found that it's easy to start chatting aimlessly, but much harder to get a true exchange going. Chatting to everyone who sends you a request or gets to know you through your profile can feel like a waste of time. If you want to practice equal exchanges in a specific language, tell this to your partner right at the start and be a bit tough when you need to be. Working with the Language Exchange feature in HelloTalk felt great to me as it allows the app to do the policing. Okay, so you've asked them where they're from and how old they are. What else can you chat about with your language exchange partner? It helps to have a few topics up your sleeve that are comfortable for any user. For example, I chatted to a Chinese partner about food and got tips for new bands to check out from a Swedish music fan. Going beyond the first small talk is important for building rapport and getting the other person interested enough to keep talking to you. This final tip is based on my own experience with HelloTalk. When I started the app, I was so excited to chat to people in Welsh and French and Spanish that I could not wait to get going. Imagine my disappointment when I discovered that not everyone was online and ready to go! HelloTalk works best as an instant messaging app when you give it a little time, wait a few days for the right people to find you or allow for a bit of trial and error. After all, language practice is a regular activity. My biggest suggestion to make this app even better would be to add some learning features. Based on the chats, the system could create flashcards or prompts asking you to repeat new expressions so you don't forget them. And an in-browser version would help me type without having to switch the mobile keyboard to another language every few minutes. All in all my verdict of HelloTalk is very very positive. As an app, this provides the nicest language exchange environment I've seen so far. You can find all links for HelloTalk at www.hellotalk.com. Have you tried HelloTalk yet? What's your impression? Leave me your story in the comments below!